To say that the best of this book comes at the end is to imply that the rest isn't nearly as good. That would be wildly off base. I started highlighting in the introduction and didn't let up until the last page. From "resulting" (page 7) to "backcasting" and "premortem" (page 221), this book is full of ideas that Duke implements to get us thinking about how we view the world. For me, the ideas kept building on one another until reaching a crescendo in the last chapter. I went from thinking "I'd like to work on this" at the beginning to "How can I not act on this?" Over the course of six chapters, Duke carefully layers concepts so that we reach the end of the book feeling like we are equipped with the tools we need to meet an uncertain world. Don't want to read the details? Just looking for a TL;DR? Skip to here. Chapter one lays the foundation, that the world is not certain and we are ill-equipped to see how this fact affects us. Duke was just short of defending her doctoral dissertation in psychology when she went on hiatus and started playing poker professionally. This background leads to her observation that life is not a game of chess, but rather a game of poker. The difference lies in what we know about the game we're playing. Chess is a game of perfect information, meaning that all observers have access to all information. Poker, however, is a game of incomplete information, meaning that no observer has access to all information. It is theoretically possible to work out the best way to play any scenario in a game of chess but that can't be done in a game of poker. That idea is easy enough to absorb but the consequences of it are much more complicated and far-reaching. Life is messy and hard to comprehend. Unlike in chess, the quality of the decisions we make in life are not strongly correlated to the quality of the outcomes. Once an outcome is known, we forget the work that went into making the decision. We deal with that by extrapolating back from what we can observe, results. Poker players call this "resulting", evaluating a decision based solely on its outcome. Duke stresses that we shouldn't feel bad about outcomes that didn't go our way nor should we feel good about the outcomes that favored us. The main point that I took away from this chapter was that we should avoid thinking of alternatives as right or wrong but as varying degrees on a spectrum of possibilities. Chapter two expands on this idea by framing decisions as bets about an uncertain future. We are usually betting that a potential future is one in which we are happier or better off in some way because of the decision we are about to make. Unfortunately, we have many things that cloud our judgement of these potential futures, things like biases and motivated reasoning. Duke espouses "truthseeking" as a way of mitigating those obstacles. Rather than seek "right" or "wrong" for a given situation, we should seek to describe the situation as accurately as possible. This leads us to then assess decisions in terms of the likelihood of different outcomes rather than things going right or wrong. There's a great deal of similarity in the main points of the first two chapters and I think that this says something about Duke's diligence in creating a sound framework to build on for the remainder of the book. Chapter three is an introduction to probabilistic decision making. If we view decision alternatives in terms of how likely they are to happen then we position ourselves to recognize that outcomes are not as surprising as we might have once thought. This sets us up to treat outcomes as learning opportunities, places where we can tweak the accuracy of how we view that decision space. "Updating our priors", as it is referred to in Bayesian-speak, is how we strive to make ourselves better decision-makers, one decision at a time. Duke recommends re-framing the rewards we give ourselves to accentuate "being a good credit-giver, a good mistake-admitter, a good finder-of-mistakes-in-good-outcomes, a good learner, and (as a result) a good decision-maker." As we improve at these skills, we also improve at assessing the risk of a situation, which allows us to make better bets. Confidence in our decisions becomes less of an expression of ego and more of an expression of our internal calculus. Chapters four and five remind us of the importance of having help in our truthseeking journey. Knowing that we are susceptible to blind spots, biases, and prejudices, Duke recommends that we find like-minded people to accompany us on the journey. Duke also warns us of "Lettermanning", which is attempting to engage in truthseeking with someone that doesn't join us on the journey. We have to look for company for our journey and that means recognizing when others aren't interested in that journey. When we do find others to join us we need establish ground rules that will allow the group to avoid emotion and engage in deliberative discussions. Together we are asking questions that set us up to make smarter bets/decisions. When the goal is to win a bet, we are more likely to speak truthfully than when we are intent on making good impressions on others in the group. Again, Duke is impressing on us the importance of seeking truth above feeling good. Chapter six contains what I think are the most interesting assertions in the entire book. Duke spent the first five chapters of the book preparing us by getting us to believe in the value of truth and giving us tactics to work around biases to better reveal truth. Now Duke pushes us in a direction that we can only see once we have left behind the security of ego; she invites us to step into a time machine. We are now in a position to accept than we aren't reliable, so we are asked to accept that we are not reliable in the present because of how emotional and reactive we can be. If we can move ourselves into the future, we give ourselves a better chance to recognize how far is too far or how much is too much in our decisions. When we take the time to imagine possible futures through our new truthseeking lens, we can make decisions while the stakes, pressure, and stress are low and our self control is high. When we know that we have to answer to our truthseeking friends if we go back on those pre-made decisions, we are more likely to stick to those decisions when the high stakes moment comes. The better we get at time travel, the further into the future we can reliably plan. Now that we are in the future, it's time to look back on our present situation. Duke recommends two tools for looking back from the future, "backcasting" and "premortems". The two terms are complementary, one looking back from a positive future, the other from a negative one. The goals of both are the same, to do our best to reconstruct how we got from now to then. We are forced to ask ourselves which decisions we made, which obstacles we overcame, or which obstacles tripped us up. The "past" spreads out behind us, full of so many options and opportunities. Once the hypothetical past becomes an actual past, we are likely to quickly forget all of the options and opportunities that were once so clear to us. This leads us right back into the trap of resulting from chapter one. I look at backcasting and premortems as tools that I should add to my decision-making toolbox as quickly as possible. In order to be a better decision-maker, I need to first learn to separate my decisions from my ego and all its dangers. Next, I need learn to look at decisions in terms of probabilities instead of dichotomies. Then I need to learn to seek truth and seek others to join me in that search. Once I have begun this search, I can start using my time machine to continue to expand my decision-making skills by looking back from my hypothetical futures. 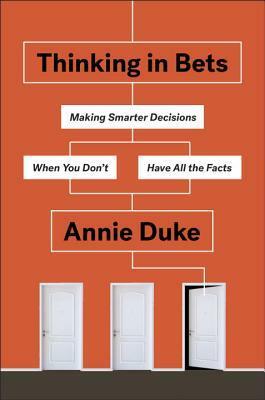 Annie Duke has laid out a thorough and achievable plan for getting better at making decisions and I can't wait to get started.